I decided to knit Aeryn a new sweater. 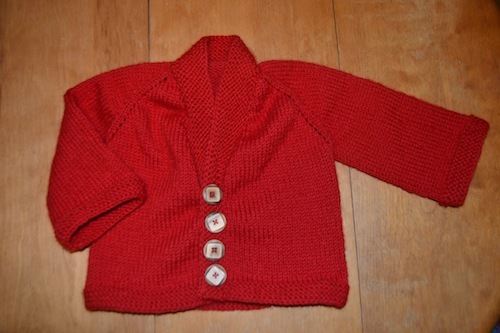 I did the same for Alyx when I was pregnant with her (purple cardigan with orange buttons and it looked very homemade but I still loved it on her), but with a toddler and the enormous amount of canning I do in the summers I hadn’t gotten to start working on one for Aeryn yet. I found this pattern while I was poking through pinterest, dangerous, and had to make it. Stop all projects, its time to get this baby made! Sorry for the lack of models, I knitted a 12 month size to give my little chunk some extra growing room but it turned out closer to an 18+ month size. Alyx could wear it if the sleeves where and inch longer. I didn’t intended for quite that much growing room. 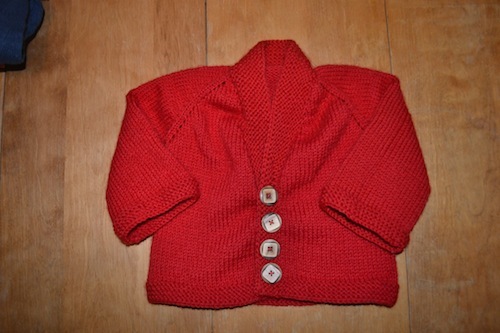 I used Paton’s Wool yarn, Joann’s always carries the brand and you don’t need to spin it! The sweater took maybe 1.5 skeins. And knitted up really quickly. From start to finish it was maybe a week of night time knitting. The buttons on the other hand took me another week to get to sewing those bad boys on. It really was an easy pattern to follow and read, which means I didn’t have to make it up as I went! I really recommend this pattern. It is ridiculously adorable on little ones of all ages, boy or girl!